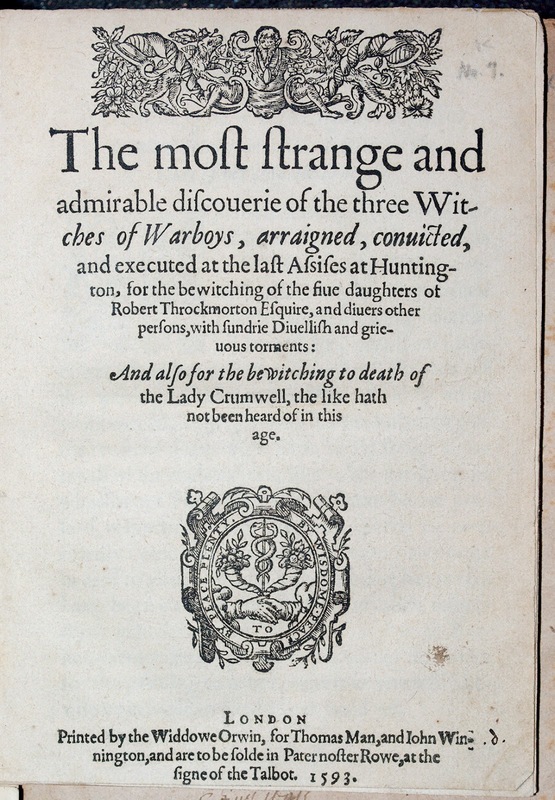 Coming across a sixteenth century pamphlet on the trial of witches in Warboys was an intriguing insight into the dangerous world of the time. First Jane, the daughter of Robert Throckmorton was attacked by stomach pains and seizures. These became associated with the presence of an old lady, the 76 year old Alice Samuel. Though the parents and household initially sought not to blame Alice, events would soon conspire against her as the other four children of the household and some of the staff became ill and began point the finger at her. It has been postulated that perhaps ergot poisoning of ryebread could have been to blame. I could not help feeling that whilst this might have initially been the case, something more sinister could have occurred. If you read the pamphlet, you see how different people tried to find a rational explanation by taking children to different locations (away from the house) – where seizures would cease. Or by confronting the child with the elderly Alice either by sight or by touch – in which case the seizures would occur. My personal take on how the situation developed was that perhaps the children took a dislike to Alice and then either deliberately or through autosuggestion initiated siezures and spasms in her presence. In some instances, it is quite clear that believing themselves possessed by an evil spirit, the children had a wider latitude to indulge in misbehaviour, verbally and physically. Could malicious child play have led to tragic results? And the final, lethal straw – a misplaced phrase by Alice when protesting her innocence. Lady Cromwell, a friend of the family (and Oliver Cromwell’s grandmother) visited and wanted to cut off a lock of Alice’s hair as part of a witch’s test. Alice, insulted, responded with "Madam, why do you use me thus? I never did you any harm as yet." That night Lady Cromwell had nightmares and later died. Eventually Alice, her husband and daughter were all implicated in witchcraft and murder, even persuaded to confess and give the names of the spirits they set upon the children. They were hanged after a trial in 1593 for murder by witchcraft. This all occurred in Warboys and at the Assizes in Huntingdon. The story was put to paper, presumably by Thomas Man and John Winnington. Now we come to a positive element in this pamphlet. The printing was done by the “Widdowe Orwin”, in London, the seat of nearly all the country’s printing presses at the time. In the sixteenth century, women were not allowed to have property and certainly played a secondary role to their men in society. However, when printer William Orwin died in 1593, his widow was in the unusual situation of being able to continue working the presses, publishing eight works in all, of which this is the one quoted most often. Of course, she would have lost all her rights to property again on re-marriage. Four hundred and twenty years on, she was still helping me as I digitised her work. The care taken with the printing ensured that the first word of the next page appeared at the bottom of the previous one. Whilst leafing through the delicate leaves of the pamphlet, I had a clear guide as to whether I had skipped a page due to them sticking together. I could not find out more about this lady, the Widow Orwin, who produced a pamphlet “To be sold at Pasternoter Rowe, at the figure of the Talbot”. Perhaps someone else can take up the flag. I did learn that a misplaced word can have unexpected and deadly consequences.